And I knew then exactly what I had to do. Well, why go on until I tell you the story? I had just returned from shopping at Super Fresh where I had purchased four bags of groceries. One contained frozen foods, another juice and milk, a third cereal and pancake mix, and a fourth consisted of a package of kosher hot dogs, a container of mustard, and a small jar of midget gherkins. "Yes, sir?" said the beady-eyed middle aged woman behind the counter. "Well, I'm sure we don't know anything about that, sir." "Listen very closely to me: You see, what I do have are a very particular set of skills; skills I have acquired over a very long career. Skills that make me a nightmare for people like you. If you let my groceries go now, that'll be the end of it. I will not look for you, I will not pursue you. 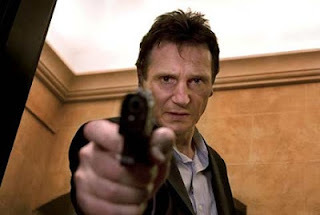 But if you don't, I will look for you, I will find you, and I will kill you." "Please, please, we don't want any trouble!" she cried. "You ... you can look through the store if you want." Down I went through the frozen foods aisle. There was a young store associate mopping the floor in front of the Eggo Waffles. Was it clean up - or cover up - on aisle 15 ? I seized the mop, slammed in into his solar plexus, and watched him fall faster than the price on a Perdue chicken that had hit its expiration date. I searched the surrounding food cases. No bag containing kosher hot dogs, mustard, or gherkins. "So long, my friend," I called to him. " You can leggo my Eggo." In another aisle, I saw an 80-something year old gentleman checking out the specials on Orville Redenbacher Popcorn. "Why look for specials," I said "when you've already scored for yourself a free bag of kosher hot dogs, mustard, and gherkins!" I left him doubled up fresh in my grocer's dairy case. No fourth Super Fresh bag either on his person or Mr. Redenbacher's. "Mr. Block," a voice resonated overhead , "please report to Customer Service,"
I laughed derisively. So Super Fresh was ready to come clean at last. I'd had them scoped out from the beginning, scoped out as steely-eyed efficiently as I'd have scoped out a "buy one get one free" box of mallomars. "Mr. Block," said the beady-eyed woman "here is your bag of groceries." "That'll be the end of it," I said. "I will not look for you, I will not pursue you, I will not kill you. But who took my bag of groceries and why?" "No one took it, you moron. You left it on the check out counter right after the register." "Oh. Ummm, sure ...uhhhh ... however did you find it?" "Well, you see, Mr. Block, what we do have are a very particular set of skills; skills we have acquired over a very long career ...."
It's nice to know I am a hit among PhDs in 19th Century British Literature. If I can just nail down the PhDs in Great Russian Literature by Authors of the 19th Century who Loved Golf, I'll be well on my way. No, I don't do reviews. Only parody, satire, and self-deprecating humor. Maybe a parody review, like "Dark Knight Rising" reviewed by a very jealous Superman. I'm so happy to see you right side up, DPB! Actually I have always wanted to write a dynamite "trust in leadership" piece but I just can't find a way to shoehorn Liam Neeson into it! LOL. Perry, I haven't seen the movie, but it can't be more entertaining than this blog. Glad you recovered your groceries. I have seen the movie, and it is a bit more entertaining than this blog but no more heroic. My groceries said the same thing!